Rumi Ide is a social activist specializing in reducing the 1.3 billion ton a year world-wide food loss, a certified　consumer advisor, certified by the offices of the Prime Minister and Minister of Economy, Trade and Industry of Japan. She then joined the Lion Corporation where she was runner-up in a contest judged based on volunteer work. She decided to leave the company and "make a difference for humanity" by becoming a participant in the Japan International Cooperation Agency (JICA). On returning to Japan she worked as both the head of the public relations and operations for social responsibility at Kellogg Japan where she started aid to food banks that distribute surplus food to the needy. She left the company and started office3.11 (KK) after the life changing events of March 11, 2011 when she became appalled by seeing the large amount of food aid wasted during the recovery from the 2011 Tohoku Earthquake and Tsunami (officially called the Great East Japan earthquake and referred to as 3.11 in Japan due to the date it occurred). office3.11 worked on PR for food banks, which led to it being the first NPO to receive the Grand Prize for both the PR Awards Grand Prix in the category of Social Communications and for the Food Industry Affairs Bureau of the Ministry of Agriculture, Forestry and Fisheries Director General Prize in the category of Food Industry Waste Elimination, as well as other prizes. 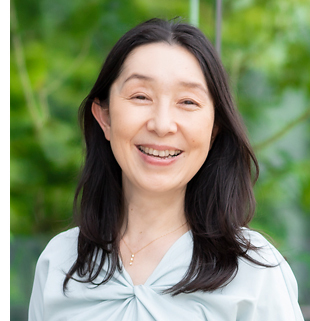 She has appeared as an independent agent over 200 times on NHK, the Japanese public broadcasting station, in the Nikkei Newspaper, as well as other media outlets. She chairs the "Kawaguchi Food Loss Reduction Review Team" which also includes members from the City Council of Kawaguchi, officials from Saitama Prefectural government, the Board Chairman of the Commercial District Promotion Association of Kawaguchi, and local bakeries, etc. As chairperson she conducts monthly meetings that hold regular food drives collecting surplus food and distributing it to the needy. I worked at a foreign food products company for 14 and a half years. I was in charge of PR and nutrition-related work. When the Great East Japan Earthquake hit on the same day as my birthday (March 11), I became involved in volunteer efforts to aid victims, including making numerous deliveries of relief supplies to the affected areas. As a result of this experience, I quit my job and became independent. The sudden death of my father, a life-long salaryman (a bank employee), when he was 46 from stroke also deeply influenced the way I live and work. 1989: Joined Lion Corporation. I evaluated skincare products and conducted research on skin aging (wrinkles and blemishes) in Lion's Home Economics Research Lab. I also tracked time-series data of 100 subjects in their 20s to 50s. Out of four peer members, I won 2nd place in Lion's lab research contest based on the theme "Development of Nursing Products." From my experience in volunteer nursing, interest in food since age 5, and interest in Asia, I joined JICA's Youth Overseas Cooperation Volunteers after passing two rounds of exams. 1994: As a candidate of JICA's Youth Overseas Cooperation Volunteers, I spent three months training in Japan and one month engaged in language training in the field. I was assigned to the Philippines as a food process team member in 1994. I worked on improving the nutrition of low-weight children and using molokhia (a vegetable) to improve nutrition. I also worked with a Philippine NGO to provide occupational support (including establishing a project to teach unskilled women how to cook molokhia and how to make candies and biscuits to sell on the street). 1996: I was evacuated back to Japan just before the end of my two-year term as a result of depression due to physical and psychological fatigue. I spent rock-bottom days for a while. After a blank period of five months, I worked in the sales office of a book store, responsible for receiving and placing orders. 1997: Joined Kellogg Japan, a foreign-capital company. I was involved in PR, customer support, and nutrition-related work as the assistant to the general manager of consumers affairs/PR. In 1998, I began taking classes at Kagawa Nutrition University on practical nutrition and clinical nutrition. In 2001, I entered Kagawa Nutrition University's Working Professional Graduate Degree Program (in nutrition science). I studied the effects of brown rice and wheat bran on skin conditions and the body, and obtained a master's degree in nutrition science in 2003. I obtained a PhD in nutrition science in 2006 for studying the effects of brown rice and wheat bran on intestinal environment and skin conditions. These findings were reported in newspapers and on radio and TV programs nationwide. Since 2003, I have received invitations from elementary, junior high, and high schools, PTAs and boards of educations, and nutrition colleges to give lectures on food education and nutrition. I had sole PR responsibility for an entire company since 2001 for about ten years. I have also written and sent PR newsletters for 11 years since 2000, for a total of 1,305 newsletters. I have given addresses at PR workshops for organizations including Keidanren and the Public Relations Society of Japan. Based on ten years of experience practicing one-person PR in combination with other duties and working as a PR director, I taught classes on corporate PR in December 2010 and June 2011 as part of Senden Kaigi's "PR Officer Development Course." I was the only woman instructor. On July 27, 2011, five days after ending my employment at Kellogg Japan, I received a six-month contract to work on social media PR for food products while delivering relief supplies to Ishinomaki City in Miyagi Prefecture. A week later, I received an offer of a six-month contract to practice PR for a food banking NPO. As a result of these opportunities and an assignment to write columns for six months, I decided to go into private practice. My radio column "One-Woman PR Authority Rumi Ide's Column" has been on air since September 2011. My two-page column, "Introductory PR Stories," has been running bimonthly in Senden Kaigi's monthly magazine "Kouhou Kaigi" since Oct. 1, 2011. At Second Harvest Japan, the country's first food bank (established in 2000), I have been responsible for strategic PR and communications since Sept. 21, 2011. Since Sept. 15, 2011, I am responsible for the PR of Tsuruga Kangou Kaihatsu K.K. (Hokkaido)'s HAPO business division. I am responsible for the social media campaign of their vegetable sweets introduced in July 2011, which have no artificial coloring or flavoring added.